We'll continue on in our journey through the great book of Revelation by getting our teachers together again to unwind Chapters 4-7. Feel free to watch, listen, or read along by clicking one of the icons below. Dr. Reagan: I'd like to start it off by asking what you think the fundamental purpose of Chapters 4 and 5 are, those chapters that picture John in Heaven. Don McGee: I think it's an important preface for everything that's going to happen beginning in Chapter 6 and following. The readers of that day, and I think the readers of today, need to understand that this is not a cosmic explosion out of control. What's going happen? I think people need to understand that God is still in control of this situation. 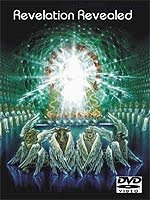 He's still on His throne in Heaven and He's still over and ruling the affairs of earth. Now, that doesn't mean that he's picking and choosing details, things that people are going to do on the face of the earth, but it does mean that He orchestrates this and He overrules that and He channels things to bring about the accomplishment of His will. A lot of people back in the day if they did not understand what's in these chapters would have thought that this was a world gone amuck and that God was not in control. The old saying is that the animals were running the zoo kind of thing, or the prisoners were in charge of the prison. Dr. Reagan: Not only back in those days, but I believe today. The book of Revelation is relevant to people in all ages, and often today I have to go back and read this to assure myself when I see what looks like the bad guys winning in the world. I have to go back and realize God has the wisdom and power to orchestrate all the evil of mankind to the triumph of Jesus Christ. Don McGee: That's right! The kind of work we do, well, we get questions like that all the time. "What's going on in the world today?" After 9/11 and some of the other disasters, people asked, "What is happening?" Well, the answer to that is that God is overruling in the affairs of man, and people need to understand that. Without that there is no hope. If we had our hope in the United Nations and any other government to make things right on this earth, then we would be a hopeless people. It would be difficult to sleep at night. Dr. Reagan: Any other point you see in Chapters 4 and 5? Don McGee: Yes, and I think one of the greatest things that we can see out of this is that this whole epicenter is the Earth. This battle is not about something that is in some cosmic place out there in space. This is happening on this earth and that's important. Salvation — when Jesus redeemed this world — it wasn't just the souls of men. Jesus came and He died for the souls of men, certainly, but He also came so that He might redeem the Earth. The Earth is under a curse, and God did not intend for it to be that. Dr. Reagan: Well, originally, God intended for man to have dominion, but when Man sinned Satan stole that dominion. Right now there's a cosmic battle over that dominion. Jesus won it back on the cross, but He has not yet taken it, which He will do when He returns. Don McGee: That gives me a lot of hope to know that this thing is not only just a spiritual thing, but it also has reference and application to the physical world — this planet on which we live. Dr. Reagan: What about you, Dennis? Dennis Pollock: Well, when I read 4 and 5, one of the things it reminds me of is a trip I had to the Six Flags Amusement Park some time ago. We went on a ride that took us high above the whole amusement park, and it's one of those slow rides where you sit in it kind of like a ski lift and you just ride above everything. And, as we went over an arena that had at that time the Batman Show, we were able to see the whole thing. We were able to see the front where Batman and his cohorts and the Joker and all those guys are having it out, but we were able to look behind the scenes and we were able to see the crew and all the little stuff they were doing to make this thing happen. We had a behind-the-scenes view. It was fascinating just to watch how they were making it all happen. That's what Revelation 4 and 5 is really doing for us, it's taking us behind the scenes. What the world is going see is perhaps nuclear war and all kind of death and destruction, plagues and misery. Behind the scenes, there's a lot going on in Heaven and we're seeing that in Revelation. One of the things we see behind the scenes is worship. In fact, this is a theme that runs all through the book of Revelation. It is a tremendous book of worship. So, you have this incredible dichotomy where on the Earth there's destruction, there's misery, there's death and there's judgment. In Heaven there's peace, there's worship, there's praise, and they're saying, "Oh, God, you are worthy to be worshiped because your judgments are being manifested." So, this is an incredible chapter and Revelation does this — it takes us from the Earth to Heaven, back to the Earth, and again to Heaven. And, we're seeing what has to happen at the beginning. That's the first thing before the Tribulation actually kicks off. Dr. Reagan: That's a great illustration, Dennis, and I appreciate it. Dr. Reagan: Now, Dennis, you mentioned about the kicking off of the Tribulation. Well, this is preparing us for Chapter 6, and suddenly we are told that one-forth of humanity dies in the initial plagues. In today's terms that would be one and a half billion people killed in this initial episode. Now, why would a loving God allow such carnage? How do you explain that to somebody? Don McGee: I don't think that God is not the orchestrator of this carnage, as He's allowing it. What He's doing is He is allowing mankind to come to full fruition in its independence and its rebellion against God. Dr. Reagan: In effect, He just takes his restraining hand off and says, "Okay, let sin multiply." Don McGee: "You guys wanted it, it's yours." Dennis Pollock: But, I think you have to be careful, because one thing you do see throughout Revelation is that God is very much directing the carnage. He may not be causing it, but you see an angel blowing the shofar (a trumpet) and judgment falls. An angel taking a bowl of wrath and pouring it out on the earth and terrible destruction happens. Jesus Christ the Lamb of God is unrolling a scroll and breaking a seal and a terrible judgment then happens. So, it's not like God is up there ringing His hands saying, "Oh, what terrible things are happening. I wish I could do something." He's very much involved, and in a sense He's like a band director, even though it's done through His allowing of it. He's still controlling it and He's still directing it. Dr. Reagan: What is the purpose of it? Dennis Pollock: Well, I think there are a number of purposes. I think one of the purposes is to bring as many people to repentance as He can. I mean, that's ultimately God's greatest desire — to bring people to Christ. As I teach on Revelation, one of things I say is that we see the love of God in this book and some people reply, "Well, where do you see the love of God?" Well, John sees this huge multitude of people so large you can't even count them. Dr. Reagan: A multitude that's been saved. Dennis Pollock: Yes. And, an angel is asking, "Who are these people?" And, John answers, "I don't know, who are they? Well, these are the ones who've washed their robes and made them white in the blood of the Lamb. But, they've come out of the great Tribulation, so even in the midst of all this carnage and misery, the Holy Spirit is still wooing people to Christ, and I think that's a big part of it. Dr. Reagan: To me, that's the fundamental purpose of the whole Tribulation. It's not just for God to punish those who have rebelled against Him and rejected His grace, mercy and love, but for Him to bring people to the end of themselves so that they will receive Jesus as Lord and Savior. I think even when God pours out His wrath the fundamental purpose is for salvation. Don McGee: This points out one of the major characteristics of God. Grace is not something that is associated only with Matthew through Revelation. Grace is something that is associated with Genesis right on through Revelation. God has been a God of grace all through the Bible, and it doesn't stop when He pours out His wrath. He is a God of grace, even then allowing people to repent, those who would. Dennis Pollock: Yes, and there's a scripture that says in wrath remember mercy, and that's what's happening. In the midst of all the wrath, God is still remembering mercy. He is drawing people to Himself. Dr. Reagan: What a God, what an awesome God we serve, that's wonderful! Dr. Reagan: One other thing, and that is that in this particular section of Scripture we have one of the most intriguing and abused of all passages, and that is in Revelation 7:1-8 where we have the mention of the 144,000. Now, the Jehovah's witnesses claim to be the 144,000. The Moonies claim to be the 144,000. Everybody and his dog claims to be the 144,000. Who are the 144,000? Don McGee: Well, the Jehovah's witnesses ran into a problem whenever their group got to be over a 144,000. They generate theology is what they do. But, the answer to that is very simple. It's what God says they are — they're the Jews, 12,000 from each tribe totaling 144,000. You do not have to be a heavy theologian to figure this one out. Dr. Reagan: I went through all of the commentaries I could find one time on the book of Revelation and looked at this passage. I found that about 80% of them said this is talking about the Church. And I thought, "What would God have to do to convince us he's talking about 144,000 Jews? He names them by tribe, I mean, He says they're Jews! What do you have to do to convince somebody he's talking about Jews? Don McGee: If you believe that God is through with the Jew, then you can make the 144,000 out to mean just about anything. Dr. Reagan: This is the viewpoint that has dominated mainline Christendom for 2,000 years. God washed His hands of the Jews in 70 AD and has no purpose left for them. Therefore, why would He be doing anything with a 144,000 Jews in the end times? This must be some symbol for something, so it's a symbol for the Church. Don McGee: In the process of making it a must-be, then they have all kinds of concoctions that they come up with about who these people are. Doesn't make any sense whatsoever! Dennis Pollock: Well, if your theology precludes you from taking the Scripture at what it says, you better change your theology. It comes down to that. Dr. Reagan: Yes, well, you know I grew up in a church that taught over and over that there's not one verse in the Bible that implies that Jesus will ever put His foot on this earth again. Then I found Zechariah 14 when I was about 12 years old. It was very clear, I mean, a 12 year old can understand it. It says Jesus is coming back to Jerusalem. When His foot touches the Mount of Olives it's going split in half. He'll speak a supernatural word and the Antichrist's forces will be destroyed, and in verse 9, on that day He'll become King over all the Earth. I took that to my pastor and I said, "You say there's not a verse that says He'll ever put His foot on the earth again, well, what about this?" And he looked at it and he read it and he read it and read it and finally he looked up at me and he put his finger in my face and he said, "Son, I don't know what this means, but I'll guarantee you one thing, it doesn't mean what it says." Well, that's what you get into when you've got to conform the Scripture to your preconceived ideas. Don McGee: The term they like to use is "apocalyptic", and that is a catch-all phrase for anything either they do not understand or they don't want to believe. Dennis Pollock: Basically, it gets you off the hook because you don't have to try to figure anything out. You can just throw it into that big lump category of apocalyptic and say, "Who knows?" 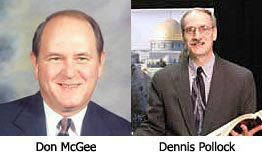 Don McGee: And who's going question you on it? Dr. Reagan: My friends, when Jesus returns He is going to return either as your blessed hope or your holy terror. That's because the Bible teaches that God deals with sin in one of two ways — either by wrath or in grace. Don McGee: Listen to these words from the sermon by John the Baptist taken from John 3:36. "Whoever believes in the Son has eternal life, whoever does not obey the Son shall not see life but the wrath of God remains on him." Dennis Pollock: The choice is grace or wrath, and the choice is yours. If you've never received Jesus as your Lord and Savior, then you're a sinner under the wrath of God. If you'd like to move from wrath to grace, then you need to confess to God that you are a sinner, repent of those sins, and receive Jesus as your Lord and Savior. Dr. Reagan: Let me give you an illustration of what Jesus did for you on the cross. Back in pioneer days when the wagon trains were going across the central plains of our nation, there were many things the wagon masters feared. They feared things like dried up water holes, blizzards, plagues and Indian attacks. One particularly fearsome thing was the prairie fire. The grass was often three to four feet high and very dry and it could easily catch fire from a lightening strike. Now, if the wagon master saw smoke on the horizon, he knew he had only moments to act because the prairie fires often traveled at the rate of 60 miles an hour. But, despite the danger, there is no recorded loss of a wagon train to one of these fires, that's because there was a sure way of guarding the wagons. Here's what the wagon master would do. He would go to the opposite side of the wagons from where the fire was coming and he would set the grass on fire and let it burn away. When it had burned away sufficiently he would take the wagons and circle them in the burned out area and wait for the prairie fire to arrive. And, when it arrived, it would of course just simply burn around the wagons and move on. In like manner, when Jesus was hanging on the cross, every sin you and I have ever committed and ever will commit was placed upon Him as our substitute and the wrath we deserve was poured out upon Him. Don McGee: That means that when you accept Jesus as your Lord and Savior, you step into the area where the wrath of God has already fallen and you become immune to God's wrath. Dennis Pollock: Again, let me ask you, are you under wrath or grace? It's a terrible thing to be under the wrath of God, but it's a glorious thing to be a subject of His amazing grace. To move from wrath to grace, to step into that area where the wrath has already fallen, confess to God that you're a sinner, repent of those sins, and receive Jesus as your Lord and Savior. Don McGee: And, when you do that, be sure to seek out a Bible-believing church where you can witness your faith in Jesus publicly in water baptism. In the next part on this series on Revelation, we'll reel from looking at six of the seven horrific Trumpet Judgments of Chapters 8-9.